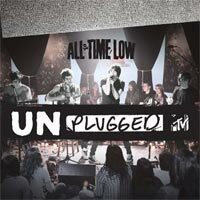 All Time Low stripped down their songs to just an essential heart-beat for a special MTV Unplugged performance. Shot in New York City during the summer of 2009, the band took their high-energy performance down a notch in the candle-lit studio for some very fortunate fans who intently sung along. The CD/DVD contains a six-song acoustic set of brandnew stuff from Nothing Personal and your original favorites from So Wrong, It's Right, including Damned If I Do Ya (Damned If I Don't), Dear Maria Count Me In, Jasey Rae, Weightless, Coffee Shop Soundtrack, and Remembering Sunday (featuring Kate Voegele). Everything you love from All Time Low performed acoustic with bonus bongo action, tambourine, and a guitar in a bird cage.